As much as I like to proclaim that I don’t exercise, the reality is simply not true. While I might not partake in dedicated workouts or fitness regimes, there is plenty of physical activity in my day. My job keeps me on my feet all day, and I do enjoy getting outdoors and going for walks through my neighbourhood in the afternoons. Not to mention all of the incidental exercise involved with tasks like housework! As with every other aspect of my life, my diabetes needs due consideration when I’m active as well. I’m a big fan of reading offerings that give me practical information I can take away and apply to my own diabetes management at home. It’s one of the reasons why I’m such a big fan of Christel Oerum, a longtime T1D and co-founder of the website Diabetes Strong (diabetesstrong.com). Christel created her website after struggling to find information about exercise and nutrition with diabetes. 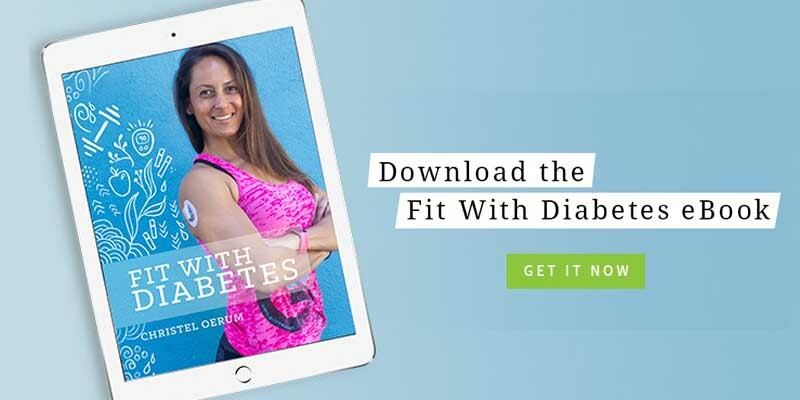 Christel has recently launched an e-book, Fit With Diabetes, and kindly sent me a copy which I had the pleasure of reviewing. The book kicks off with a chapter on goal setting and finding your motivation, which will likely resonate with most readers. Who doesn’t have something at the back of their mind that they’re aspiring towards? Even if your direct goal isn’t fitness related, I’m willing to bet you would find something in this book that will help you reach that goal. Improved blood sugar levels, better nutrition and healthier lifestyle comes to mind. I was nodding my head as I read through the chapter on Cardio, the main form of physical activity that I tend to make adjustments for. Given that getting up and going to work every day involves cardio, I’ve had no choice but to endure months and months of practice, patience and frustration to finally reach a place where I can work, eat and navigate my blood sugar levels without so much bumpiness. Most cardio workouts increase insulin sensitivity during and after a workout, causing blood glucose levels to drop. The book provides practical suggestions for reducing basal rates and insulin doses for meals in advance of a workout, right through to avoiding lows in the hours afterward. 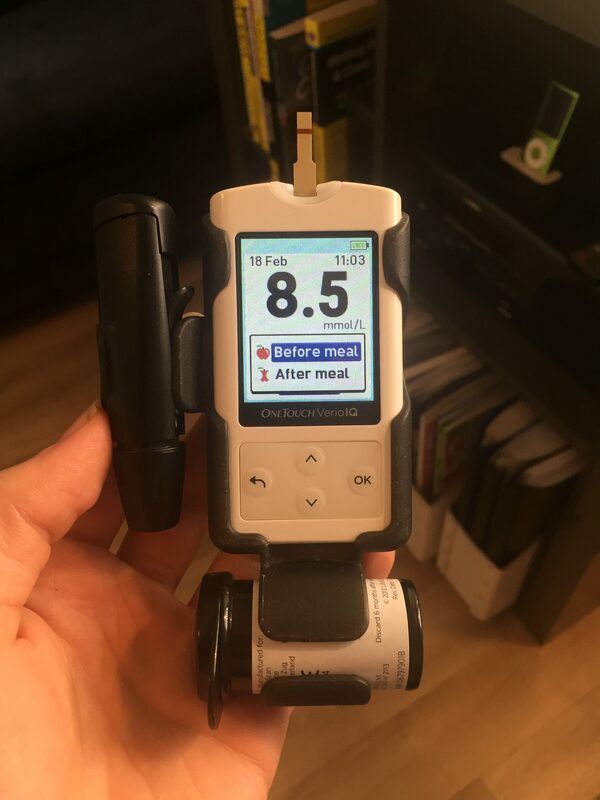 Christel’s lived experience really shines through as she provides plenty of real life examples for undertaking cardio with both an insulin pump and Multiple Daily Injections. Have you ever noticed your blood sugar levels starting to rise after exercise is over? One of the lightbulb moments that I had while reading this chapter was that a reduced pre-workout insulin bolus might need a follow up if food is still digesting once the workout is over. Ding! The book moves into resistance training, and admittedly this chapter didn’t speak to me so much as I haven’t stepped inside a gym in years! Christel talks through navigating blood sugars during these higher intensity workouts, which can cause blood glucose levels to rise. This chapter is definitely written in the spirit of motivating the reader to get into the gym and move past any personal reservations or fears. There are several pages of sample resistance workouts and illustrations in the book, with exercises that will suit both the gym go-er and someone with basic equipment at home. Christel talks through calculating your daily kilojoule (or energy) needs in order to fuel your body and match the energy you expend each day. It was refreshing to hear her recommending carbohydrates rather than avoiding them altogether. Based on her own experience, she recommends a diet of 30% carbohydrate, 40% protein and 30% fat, however of course you could adjust these percentages to suit your own preferences. Another handy tool that Christel suggests to help track your nutrition is the smartphone app, My Fitness Pal. I’ve been using it myself since reading this book and it is amazing. There are also chapters on meal planning and recipes, losing weight with diabetes and further advice to support a healthy lifestyle. The Fit With Diabetes e-book very much runs in similar veins as Gary Scheiner’s Think Like a Pancreas. It wasn’t screaming at me to change everything about myself, nor was it holding back on providing practical suggestions because ‘everyone is different.’ The book is simply there to help you get more out of physical activity while managing diabetes. Even if you’re not a fitness nut like me, I am very confident that you will find something to take away from this book. You can purchase your copy of the eBook here, and you can also follow Christel at diabetesstrong.com. 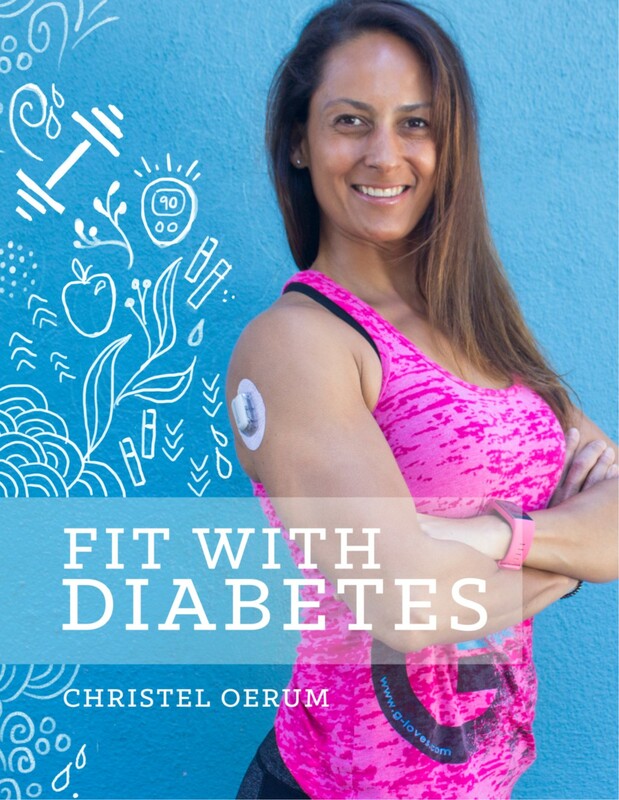 Disclosure: Christel sent me a copy of the Fit With Diabetes e-book. There was no expectation that I would write about or promote the book, and all opinions expressed here are my own! The lady behind the counter was shouting and gesturing wildly as I entered the rec centre for an evening on exercise and nutrition put together by my fellow Young Adult Diabetes Committee members. The YADC came to life a year ago and has since grown into a vibrant community of young adults living with diabetes, who are predominantly type 1s. As I found myself explaining to someone in attendance that night, this group really came about to fulfil a need that was currently missing in the Perth community. As I took a seat and the evening’s proceedings kicked off, I found myself mentally nodding as I heard concepts being explained by our guest speakers that I was all too familiar with. I looked around the room, glancing at some of the other people with diabetes and their loved ones in attendance. I observed many of them listening attentively, taking in all of the information they were hearing or jotting it down in note form. My own two parents were sitting behind me, and I wondered how easy this information was for them to take in. They know the concepts behind managing type 1 diabetes quite well. At home, I find myself talking a lot about some of the exciting developments I read about in the DOC, my advocacy activities and diabetes related travel. However, I’ve always been very independent in the physical management of my condition. I don’t bother them with all the nitty gritty stuff, like trying to figure out the best time to bolus for a high fat high protein pub dinner when my blood sugar is x mmol. The evening broke off into group sessions, where I found myself chatting with some of my fellow type 1s in the room. It was nice (but also saddening) to hear other experiences in public hospital diabetes care that mirrored mine, while there were also some inquisitive questions asked of the pumpers and CGM users. I departed this event with a far greater insight from all of the different perspectives I had heard and observed in the room during the course of the evening, and all of the different motivations for attending. During our committtee meetings, good ideas simply seem to pop among this very bright group of YADC members. I spend my spare time trawling social media, squealing with excitement over the latest device or venting my frustration over the latest coverage of diabetes in the media. I get to catch up with people in the industry and other diabetes bloggers when I’ve received opportunities to travel, who are people just like me. This event, however, had finally brought me outside of the diabetes bubble that I so often find myself sitting in. I just need to figure out how I can spend some more time here. I first received a One Touch Verio IQ glucose meter when I started on my insulin pump in May 2016. 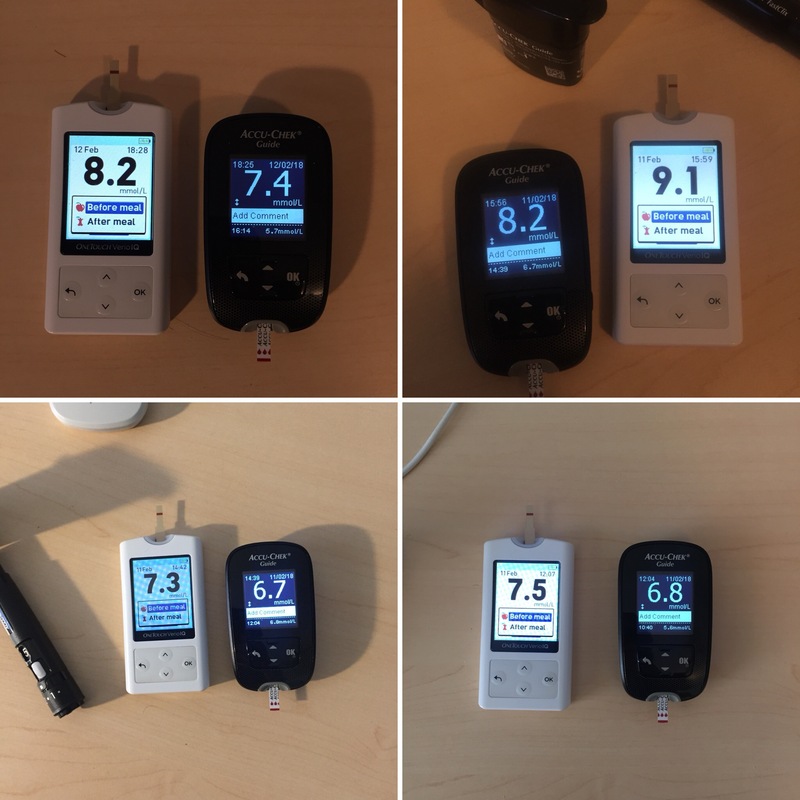 As most diabetes sales reps do, I received a rave review about how it was one of the most accurate blood glucose meters on the market. I was using the FreeStyle Insulinx at the time, which I absolutely loved for it’s ‘Lite’ test strips that only required a tiny sample of blood and weren’t wrapped in that annoying foil. Although I had no intention of switching from the Insulinx, I decided to place this meter in my travel case and use it as my spare. To give it credit, the Verio is actually quite an attractive meter. It has a colour screen and a backlight that automatically comes on when inserting a test strip. The meter is a refreshing white colour, rather than the dull greys and blacks that I’m accustomed to. By far, my favourite thing about this meter was the plastic shell that holds the meter, test strips and lancing device, which makes it super easy to carry. Unlike any other meter I’ve used, its also rechargeable. This is good in the sense that you don’t need to keep on buying batteries (which are expensive, mind you! ), but also not so good in the sense that you need to remember to keep your meter charged up before leaving the house. As a travel meter, the battery life held up well and would typically last me a month. Testing with this meter was tricky to get my head around. Unlike FreeStyle and AccuChek meters, the test strip port was situated at the top of the meter. Additionally, blood had to be placed on the side of the strip, rather than at the bottom. My pet hate was getting strip fill errors if I didn’t get sufficient blood on the strip in one go. I had a lot of these in the beginning as I was getting used to placing blood on the side of the strip. This was extremely wasteful compared to FreeStyle meters, which would give me ample time to apply additional blood. I also didn’t like the fact that the capped test strip vials only stored 25 strips rather than 50, and that boxes came with 50 strips instead of the usual 100. This was an unnecessary waste of packaging materials, and meant that I needed to buy double the number of boxes to get the same amount of test strips. Although the price was comparable to other brands, Pharmacies didn’t necessarily stock more boxes of Verio strips on their shelves. However, the biggest dealbreaker for me was the accuracy of this meter. I have consistently found that the Verio reads 0.5 to 1mmol higher than each of my other blood glucose meters. Of course when I raised this issue with Aussie distributor AMSL diabetes at the ADS-ADEA conference last year, I was basically told that it was the other meters that were wrong. The accuracy of this meter fell within the acceptable Mean Average Relative Distance (MARD) from laboratory glucose readings. It had also been recommended for calibrating readings with Dexcom, which is the golden child of Continuous Glucose Monitoring. 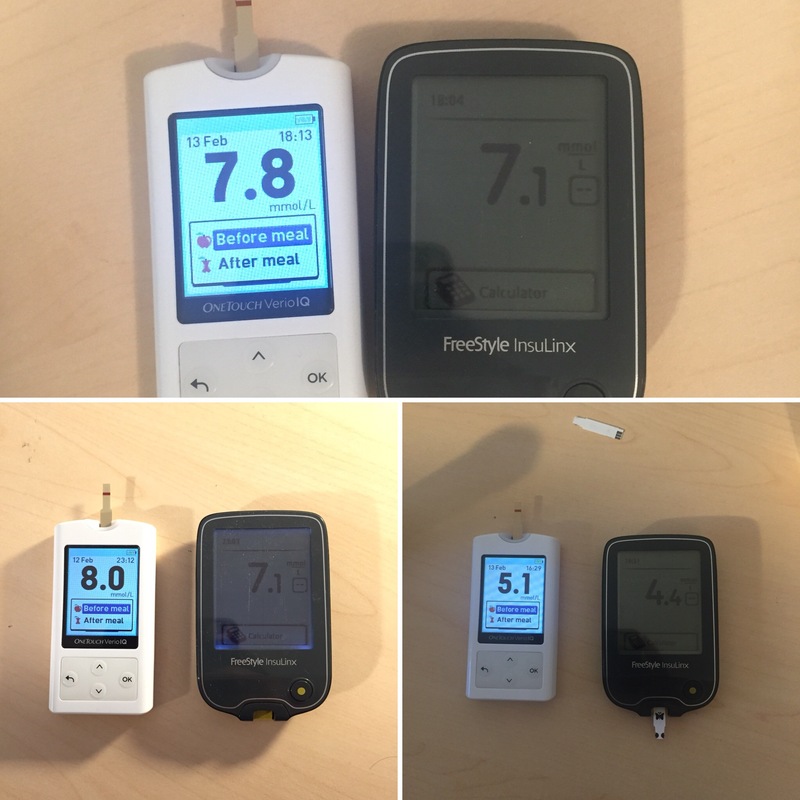 I’ve done a little experiment with some of my leftover test strips, comparing the Verio with my FreeStyle Insulinx, Accu Chek Guide and FreeStyle Libre. I washed and dried my hands prior to each test, as I’m well aware that any moisture or dirt on my hands can impact glucose readings. To be fair, all meter readings are only accurate to the nearest 1mmol of a laboratory result. Two simultaneous blood glucose readings will likely produce different results. So how do I know which of these readings I can trust? I’ve found myself feeling hypo on several occasions, only to test with the Verio and receive a reading in the 4s. Patterns as exhibited above are a regular occurrence. I’m exercising my own judgement here, in saying that I simply cannot trust this meter. Unless you’ve been living under a rock, you’ve likely heard of the whole We Are Not Waiting movement. You know, a bunch of people who are hacking their diabetes devices in order to enhance their functionality. Such as transmitting blood glucose data to other devices, turning a FreeStyle Libre into a CGM with alarms and even closing the loop between an insulin pump and a CGM. You need look no further than the name of this movement to find the reason for it. People with diabetes really are at the mercy of device companies, regulatory bodies or, in the case of the snippet I read in yesterday’s paper, researchers who are currently attempting to regenerate organs in sheep! I don’t see a cure on the horizon in the next ten, twenty or even thirty years. The business of business is business. Advancements no longer feel like a solution, but rather a pathway to the next enhancement or product. Both consumers and device companies seem too focused on feeding this diabetes technology frenzy. The most realistic advancement that I do see on the horizon is a commercial closed loop system. That is, an insulin pump that communicates with a Continuous Glucose Monitor to automatically regulate blood glucose levels. There are a few systems currently in development in the US. Yet I don’t realistically see any of these getting into my hands here in Australia in the next five, dare I say ten, years. I need look no further than the current insulin pump situation here in Australia. If online communities are anything to go by, Aussies are crying out for a new insulin pump option to hit the market here. There are insulin pumps listed on the TGA website that can be legally sold here in Australia, and yet we are left waiting at the mercy of distributors, device companies, marketers, financial strategists, and all of the other powers that be. Better yet, it’s 2018 and people are still forced to do all sorts of questionable things in the name of INSULIN, the drug with a price tag that is skyrocketing by the day. I have been reading up on the likes of hacking a FreeStyle Libre system and closing the loop over the past couple of months. There is a growing community of people here in Australia who are buidling and running homemade closed loop systems, and you can lurk or join them here. I, however, have made the regrettable decision that I will have to wait. For starters, I would have to commit to full time Continuous Glucose Monitoring. This is not currently subsidised for adults like me here in Australia. Nor is this, as well as the other hardware required, in my current budget while I am working toward other financial and career goals. Secondly, I don’t own a pump that is loop-able, and I don’t like my chances of being able to get my hands on one. Finally, I’m not sure that I would be able to give any ‘we are not waiting’ efforts the due focus that they would inevitably require at the moment, with a lot of other priorities on my mind for the year ahead. As one Facebook group admin puts it, don’t bother asking for the idiots guide as these solutions aren’t for the faint headed! I am frustrated. Not because I’m envious of others who do have the means to do so. Not because I can’t manage. Not because I don’t have good health, excellent access, good people around me or a good quality of life. I am frustrated, because people with diabetes deserve so much better than what they’re currently getting. Over the weekend, an uncomfortable incident caught my attention in a closed diabetes Facebook group. A new member to this group introduced himself as a health coach, sharing a before and after graphic depicting drastic weight loss and an image of a book he was publishing. Apart from the brief mention of the words ‘T1D for 20 years,’ there was no real substance to his post and I seriously doubted that he actually did have a connection to diabetes. While the moderators of this group were likely out enjoying their Sunday, the community in this Facebook group impressively called this behaviour out for what it was. This man was clearly soliciting his products and services, and many in the group made it clear to him that this kind of a post did not belong in a peer support group. While many healthcare professionals are still skeptical of online communities replacing their fundamental role, I felt that yesterday’s incident was an impressive example of how peer support is clearly not a place for medical advice. The Diabetes Online Community typically does a stellar job at self moderation, with the community fostering a culture where participants feel welcomed, encouraged and able to seek support from those who truly ‘get’ it. Sure, a big part of our involvement in peer support is asking questions and sharing experiences, but the majority of the community embraces the philosophy that ‘one size does not fit all’ and that ‘your diabetes may vary.’ The DOC does not belong to any one person, and I believe that the majority of the community truly embraces this. In my experience, keeping these philosophies in mind has made my experience an overwhelmingly positive one. Sure, I have witnessed uglier corners of online communities, and for the most part it’s where participants fail to acknowledge perspectives that might not be aligned with theirs. One of the best things that has come from participating in the DOC is hearing these diverse perspectives, that have opened my eyes to the reality that not everyone is in as privileged a position as I am. As for this individual, I expect that he is likely no longer a part of this online peer support group. I, for one, am glad that the DOC has the best interests of each other at heart.